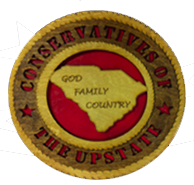 Conservatives of the Upstate welcome Pickens County candidates Philip Healy and Allan Quinn to speak at their May 8th membership meeting - open to the public. The meeting will be held at Silver Bay Restaurant in Easley on May 8th at 6:30PM. You do not have to purchase food to attend. Allan Quinn is running for the Easley District 5 House seat currently held by Neal Collins and Philip Healy is running for the Pickens District 4 seat presently held by David Hiott. They each will speak 15 minutes on why they are running for their seat and then the floor will be opened for questions. This is a great opportunity to meet and greet and vet the new candidates. Tell the hostess upon arrival you are there for the Conservatives of the Upstate meeting and she will point you to our section of seating.